Ah, the dentist. Everyone’s favourite and relaxing place to go. When Doctor Constantine, chess master and amateur sleuth, pops along, he gets a lot more than he expected. One of the dentist’s patients is somehow locked inside the treatment room. She hasn’t even got her false teeth with her! When Constantine and the other patients break the door down, it seems that Mrs Miller, the patient, won’t be needing those false teeth again – her throat has been cut. It seems that a number of the fellow patients have an interest in the victim – or in the expensive jewels that she was wearing. But a second crime soon sets Constantine’s ideas off – why would a second, unidentified woman, by murdered in the same way? Molly Thynne wrote a variety of books, but six of them, between 1928 and 1933 were crime novels. The final three featured Dr Constantine – this is the second of the three, preceded by The Crime At The Noah’s Ark and followed by He Dies And Makes No Sign. Out of print for years, those lovely folks at Dean St Press have released all six books as ebooks and paperbacks. I’ve been a little slack in getting round to some of the recent Golden Age reprints, so I thought I’d kick things off with this one. 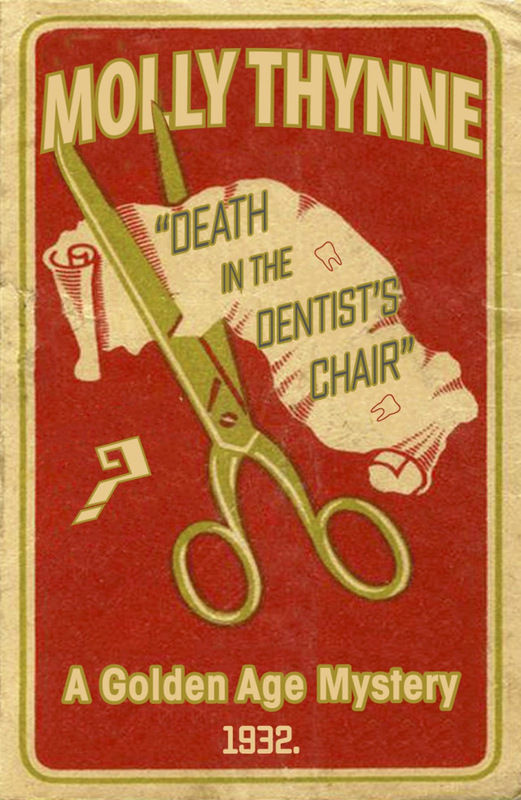 The dentists is such a vivid location for a murder – it’s a place that most people hate, there’s plenty of closed off rooms and plenty of murder weapons lying around. The most famous example of a dental mystery is obviously Christie’s One, Two, Buckle My Shoe – not read that for a long time, actually – but there are a few others. Stay tuned on the blog for an ultra-obscure one, in fact. But back to this one, and it’s a very pleasant, classic-style mystery. It’s from the Golden Age and certainly feels that way. The action oscillates between Constantine and D I Arkwright and while the plot requires a bit of an exposition dump to sort out the motive towards the end, the identity of the killer and the breaking of the alibi are rather clever. An extremely readable mystery with an interesting lead character. Not perfect, but certainly not a book that should have been lost for so long. Recommended. Many thanks to Dean St Press for the review copy. Just had a looooong dentist’s visit today with an inflamed nerve, so this is painfully current for me! Luckily, there were no murders there while I was around, although I was sorely tempted to slit my own throat after 1.5 hours with my mouth wide open at an awkward angle. Sounds like a goodun, but I hadn’t realized “those lovely folks at Dean St Press” had been “out of print for years” , , , if you don’t think the observation too, um, pedantic. The meaning is clear, but the grammar is wrong. The number of enjoyable minor Golden Age mysteries never fails to astonish me. Will the supply ever run out? I hope not. Available to read for free from Amazon if you subscribe to their KindleUnlimed deal. Oops! That should be Kindle Unlimited.